Full Figure Theatre presents the locally-developed musical 39… and Ticking! Written and directed by Sharon Heath, this clown musical deals with issues of dating, aging, raising kids and procreating. 39… and Ticking! made its world premiere last October in Burnaby and is being remounted this summer for Vancouver audiences. Featuring music composed by Ted Hamilton and Joan MacLean, with musical direction by Bill Costin and choreography by Tara Cheyenne Friedenberg. 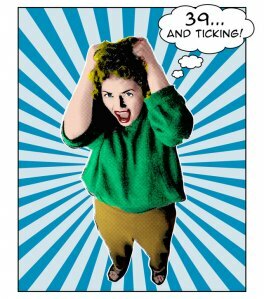 39… and Ticking! stars Joan MacLean, Lisa Beley, Lisa Bunting and Cheryl Mullen. Full Figure Theatre presents 39… and Ticking! from August 3 – 8, 2010 at the Jericho Arts Centre, 1675 Discovery St, Vancouver. Tickets are available online or by phone at 604-224-8007.